Liquid crystals are extremely small crystals with a helical structure that can be placed into a plastic sheet. We investigated liquid crystals as one of our National Critical Technology's technical applications in Component One. These crystals are aligned in a filter so that the axis of the helical structure is perpendicular to the plane of the device. 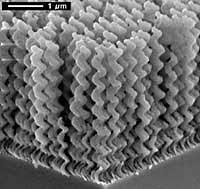 These crystals polarize circularly oriented light. The polarization of the light beam depends on the axis which the beam of light wraps around. Liquid crystals polarize clockwise (left-hand circular polarization) or counter-clockwise (right hand circular polarization). The helix of the crystals is oriented in relation to the circular orientation of the light, effectively blocking that circular pattern. By changing the size of the helix, liquid crystals can be used to totally block out, or dim certain frequencies. It can also block out, or dim certain wavelengths of light. However, when you do this you can only polarize one frequency, or wavelength at a time. When you block out, or dim the certain wavelength, the helixes allow all other waves of light to pass through. This can be solved by adding several sheets of liquid crystals together. Spacing the liquid crystal helixes farther apart allows that wavelength to be dimmed. When a certain frequency is completely blocked out, the helixes are spaced right next to each other on their axis, allowing no light to go between the spaces of that wavelength. The further the crystals are spaced apart, the larger the amount of light is let in through the liquid crystal filter. While in liquid form, liquid crystals are applied using a spray method. The crystals pass by a negatively charged rod that sticks them to a positively charged surface. Upon contact, they uniformly align themselves perpendicular to the surface. The width of liquid crystals in a polymer solution is 15 �m. They are small enough to place on a windshield as a film, or to place between to panes of glass in the windshield without affecting the refraction of light. The liquid crystals themselves are about 3-4 �m long, and about 0.5 �m wide. The helical structures of the liquid crystals are visible in the following photo. This graph displays the effect of UV rays entering the axis of liquid crystals.